Here’s a comprehensive list of places I’ve ridden. Reviews for most of these rides can be found on MTBreview.com. My goal is to ride on dirt in all 50 states before I leave this world. 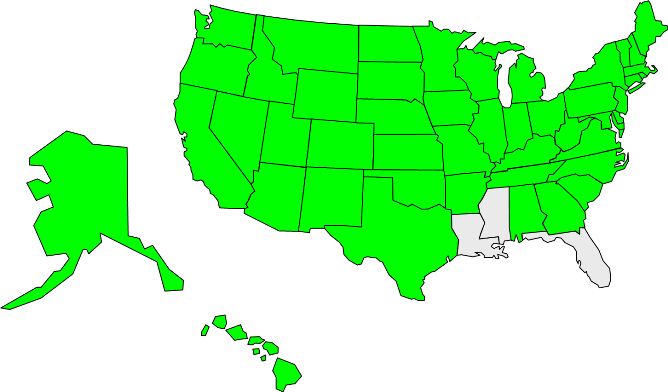 The map below highlights in green the states I have ridden. So far I have ridden in 47 states, plus three countries on two continents. Detailed “Doug’s Dozen” trail reviews follow the list. The list continues to grow each year, as trips out west and to other parts of the country seek out new singletrack. I’m always searching for that perfect singletrack. A couple rides in I’ve done in Colorado will be hard to beat. 50 Year Trail, Tucson Fun, technical singletrack, try the “chutes.” Gets more challenging as you go up. Arizona Trail, Box Canyon to Pistol Hill Site of the annual “Soul Ride.” Nearly all singletrack, very steep, technical switchbacks. Arizona Trail, Picket Post to Kelvin Incredibly remote canyons scenery. No easy bailouts. Black Canyon Trail, Black Canyon City Long point-to-point trail, remote, buff and scenic. Charouleau Gap, Tucson Jeep road climb, singletrack descent back to Catalina State Park. Tough and isolated. Chiva Falls,Tucson Jeep road out to Chiva Falls (in the Desert!). Technical, don’t ride it alone like I did! Mt Graham, Safford 31 mile, 7,105 foot climb from town to summit of Heliograph Peak. Mostly Paved. Mt Hopkins, Amado 19.3 mile, 5515 foot gain on dirt road to summit at 8585 feet. Stunning views. Kitt Peak, Pan Tak 12.1 mile, 3630 foot gain on paved road to summit at 6870 feet. Mt Lemmon, Tucson 27 mile climb from downtown, nearly 7000ft if go to summit. Paved. McDowell Mtn Park, Scottsdale Mostly easy, buttery smooth singletrack. Open and scenic. Mingus Mtn, Cottonwood Huge loop of paved climb Rt 89A and dirt descent FR-413/493. Gnarly in spots. Munds/Huckaby, Sedona Huge 2000ft climb on Schnebly Hill Rd, scenic, tech singletrack descent. South Mtn Park, Phoenix Ridgeline National Trail, base Desert Classic Trail. National hairy technical. Sweetwater Trails, Tucson Network of mostly buff trails in pristine saguaro forest. Flow! Santa Cruz Trail, Santa Barbara 3300ft in 11mi of fireroad, then 5 mile descent on Santa Cruz. Exposure!! Towsley Canyon, Valencia Great 5 mile 1100 foot singletrack loop right from town, very tight switchbacks! Trails 403/401, Crested Butte The most scenic alpine singletrack I’ve been on. Big, big views on buffed trail. Animas City Mountain, Durango A 6mi loop right from town, gains 1550ft, nasty steep and rough, great views. Betasso Preserve, Boulder Easy 3 mile loop at 6500 ft, Boulder view, start in town for good climb! Black Bear/Imogene Passes, Ouray/Telluride 45 mile Jeep road loop over 13,000ft passes. Calico Trail, Rico Brutally steep climb up Priest Gulch, knife edge ridge on Calico, descent down Horse Creek. Deer Creek, Crested Butte Loop that circumnavigates Mt Crested Butte. Great views, killer climbing. Elk Meadow Park, Evergreen A 10+ mile loop gaining 2000ft to 9700ft Bergen Peak. Views. Flagstaff Dr. to Walker Ranch, Boulder Grueling auto road climb up the Flatirons to nearly 8000 ft. Flight of Icarus, Fruita 10+ mile climb in CO-139, then insanely steep plummets on singletrack. Fear of death. Hartman Rocks, Gunnison 8000 acre playground with endless supply of buff to tech singletrack. Open, semi-arid. Hermosa Creek, Durango Cliff hugging single track, 20 miles between trail heads. Often shuttled. Horse Gulch, Durango Mesa rim riding at the college, bony ridgeline higher up. Brutally technical in places. Junction Creek, Durango 25 mile jeep road climb to Kennebec Pass, singletrack back down. Awesome descent. Lunch Loops, Gunnison Vast network, sampled only Twist&Shout, Butterknife as a loop. Methodist Mtn Trails, Salida Purpose, machine built trails. Super flowy. Try Little Rainbow to Race Track. Old Monarch Pass/Monarch Crest/Agate Creek, Gunnison Groomed gravel climb to 12,000ft divide, down rough Agate Cr Trail. Pole Creek loop, Silverton Jeep road over Stony Pass to Pole Cr, Tr 918 to Maggie Gulch. Incredible views. Teocali Ridge, Crested Butte Climb up Jeep/ATV trail, ultra hairball singletrack descent. Great view from ridge. Twin Buttes, Durango Edge of town, climby, benchcut into steep terrain. Fun! Zion Curtain, Fruita Straddles UT border, epic loop hitting Overlook, Westwater, Western Rim along the way. Lots of climbing, views. Case Mountain, Hartford Plenty of brutal, ledgy ridge riding, hairy descents and climbs. Slippery when wet. White Clay Creek State Park, Newark Lots of MTB maintained buff singletrack, some hills. Ag. Center Trail, Gainesville 3.5 mile loop, to be expanded. Did 5 laps at night. A total blast to ride. Fast! Gainesville College Trails, Gainesville About 5 miles of super singletrack. A great night ride. Silver Mtn Ski Area, Kellogg 4000 feet net gain to 6300 feet in 12.5 miles, views, singletrack up top. Hiawatha Path Rail Trail, Pearson 1.8% grade over 15 miles, 2 mile long tunnel under MT/ID border. Kickapoo State Park, Oakwood 11 mile singletrack loop, numerous dips, gullies, like riding roller coaster. Fast! Ice Cave Park, Decorah Over 20 miles of steep hills with some exposure. A real cave too, but bring a light. Sheltowee Trace, Corbin Section along Laurel Lake wonderfully countoured. Hike-a-bike dropping down to Cumberland River. Sunday River Ski Area, Bethel Service road climb to multi-peak ridgeline singletrack. Great views abound. Billerica SF, Billerica Mix of singletrack and ATV trails. Stunts. Blackstone Valley, Uxbridge Some fantastic flowy singletrack, something for everyone. Foxboro State Forest, Foxboro Maze of often rugged trails, formerly used by motos. Freetown State Forest, Freetown Many miles of singletrack frequented by dirt bikes. LOOSE. Not much fun. Georgetown-Rowley State Forest, Georgetown Technical MTBer built singletrack. Bay Circuit Trail runs through forest, connects with Willowdale. Mount Greylock, North Adams Auto road hill climb, 2800 ft vertical, highest peak in MA at 3391 ft. VIEW! Groton Town Forest, Groton Fast moving, bermed turns, can be linked in with many other trails in area. Haystack Trails, Groton Wicked technical singletrack built by locals. Numerous rock features to impale one's self on. Massasoit State Park, Taunton Fast, rooty singletrack used in Lung Opener race. Middlesex Fells, Stoneham Mix of carriage roads and singletrack. More singletrack opening to MTB. Russell Mill, Chelmsford All purpose built singletrack, log stunts, natural features. Fun. Willowdale SF, Ipswich Many, many miles of flowy, purpose built singletrack. Luton Park, Rockford Super fast, flowy singletrack built for speed. All fun-factor. Yankee Springs Recreation Area, Barry County 12.5 mi loop, hilly and fast. My first off-road ride. Holzinger Lodge, Winona Outer XC ski trail network with singletrack going up and around bluff. Memorial Park, Red Wing Purpose built singletrack that is marvelously fun to ride. Fast. Races held here. Alpine Trail #7, Swan Mtn Range Fire road up to Napa Point, then Trail 31 to #7. Views and exposure! Big Mtn Ski Area, Whitefish Awesome 8 mile singletrack to 7000ft summit, very fast, views. Hiawatha Path Rail Trail, Taft Travels down into ID at 1.8% grade thru tunnels and over trestles; night lights. Lion Mtn, Whitefish Small 1200ft rise mtn almost in town with ATV/singletrack trails. Lone Pine State Park, Kalispell Small state park on 600ft hill, singletrack, nice view of town. Mt Marston, Eureka 4000ft, 14.7mi fire road climb to 7300ft, views, serious exposure singletrack back down. Reid Divide Trail, near Whitefish Many, many miles of ridgeline singletrack, awesome descent to Tally Lake. ATV Trails, Pelham/Hudson Over 40 miles of dirt bike trails accessed from my backyard. Lots of hills! Mt Cardigan, Hebron Fire road climb up most of way, singletrack to summit unridable on north side. Drummer Hill, Keene Fun purpose built trails just north of downtown. Lots of vertical. Franklin Falls, Franklin Dense network of buff NEMBA built singletrack. Something for everyone. Greeley Ponds, Waterville Valley Rough trail out to scenic ponds. Singletrack down Snow's Mtn. Horse Hill, Merrimack Conservation land near work with growing network of sweet MTBer built trails. Mount Kearsarge, Warner Auto road climb, 1500 ft vertical, singletrack at top, 360 deg. view! Page Hill, Hill Mix of contour singletrack and super bony ridgeline. Red Tail Trail/Black Cap, N. Conway Nearly 2000ft climb (or descent) to summit of Black Cap. Fav NE trail. Wantastiquet Mtn, Chesterfield Bony fireroad climb to summit. Not best on cross bikes. Waterville Valley Ski Area, Waterville Valley Steep service rd summit climb and XC ski trails. Ringwood State Park, Ringwood Brutally rugged MTB race course with steep, tight switchbacks. Climbing. Continental Divide Trail, Silver City Scenic ridgeline riding above 8000 feet. Plenty of climbing. Glade Run, Farmington Many miles of buff, rollercoaster singletrack in desert right from town. A lot like Fruita. Alien Run, Aztec Wicked fun dessert trail, mix of slickrock and gritty clay. Many natural features. Whiteface Mountain, Wilmington Toll road hill climb. 3500 feet in 8 miles. Fastest 8 mile descent I’ve done! Calfpen Gap, Fontana Lake A 1000 foot gain in 6 miles to ridgeline, overgrown in places. Dupont State Forest, Hendersonville Unbelievable slickrock riding, waterfalls, and views. Very popular! Black Mtn/Turkey Pen Loop,Pisgah NF Possibly hundreds of miles of singletrack, brutal climbs, tech factor, and abundant views. Laurel Mtn/Pilot Rock loop,Pisgah NF Steady climbing on benchcut Laurel Mtn, 1500ft bony plummet on Pilot Rock. Tsali Recreational Area, Fontana Lake My cycling on travel, buff trails along gorgeous lake in mountains. Maah Daah Hey Trail, Grasslands National Park 100 mile singletrack through ND Badlands! Vulture’s Knob, Wooster Many miles of purpose built singletrack, bridges, stunts, gullies, fear of death. Fun! Old Military Trail, Talihina Loop with Old Military, Boardstand and Oachita. Proved to be poorly maintained. Don Valley, Toronto Upwards of 10km of singletrack with built stunts, short steep climbs, right in the city! Crater Lake Paved 33 mile Rim Drive at 7000-8000 feet. Bikes not allowed on trails. Stunning views whole time. Larch Mtn, Corbett Paved 4000ft climb from sea level, then technical 7 mile singletrack loop up top. Neahkahnie Mtn, Manzanita 1200ft fireroad climb, singletrack full of switchbacks down. Birds-eye view of coast. Powell Butte, Portland Urban park with singletrack and views of city and all the big peaks. Fun and close by. Surveyors Ridge, Hood River Huge climb up Dog River Tr, long traverse on Surveyors, down Oak Ridge Tr. Michaux State Forest, South-Central PA Site of Iron Cross race, ATV trails, fire roads, unexplored singletrack. Mont-Sainte-Anne, near Quebec City UCI World Cup event, run-in with bears, 2000 ft vertical, VIEWS! Glentress Forest, Peebles Voted best MTB locale in the UK. Miles and miles of hilly, scenic singletrack. Traquair Forest, Innerleithen Site of downhill racing, freeride park. Also very tech XC loop over Minch Moor. Issaqueena Lake Trails, Clemson Singletrack here reminded me of Tsali. Classic southeast trail. Mickelson Rail Trail, Deadwood 107 mile gravel surface trail through highly scenic Black Hills, peaking at 6250 ft.
Big South Fork Rec Area, Oneida Meticulously maintained buff singletrack that contours shear cliff drops. Incredible views! Fall Creek Falls SP, Pikeville Hiking loop to biggest falls in the east, two singletrack loops open to riding. Brush Creek, Ocoee Possibly the most perfect contour singletrack around, views of lake, rivals Tsali. Chilhowee Trails, Ocoee Mix of double and singletrack, steep climbs, technical in spots, nice waterfall. Tanasi Trails, Ocoee Purpose built trails, designated IMBA Epic, climbs and contour singletrack. Barton Creek Greenbelt, Austin 7 miles of ledgy singletrack, at times very technical riding along Barton Cr. Hill Country State Natural Area, Bandera 50+ miles of single- and double-track, long, steep, rocky climbs. Muleshoe Bend Rec. Area, Spicewood Very fast 7 mile singletrack loop used in races. Walnut Creek Metro Park, Austin Park in town chock full of singletrack, very fast, very fun. Brands Trails, Moab Purpose built, easy to intermediate terrain, flow. Just few miles out of town. Captain Ahab, Moab Purpose built tech trail, serious exposure, combine with other trails on Amasa Back. Klondike Bluffs, Moab Great trail system with something for everyone. Slickrock, flow, tech and hike to bluffs. Klonzo Trails, Moab Purpose built, easy flowing terrain, sits between Sovereign and Brands. Magnificent 7, Moab Purpose built trails just west of town. Rim riding, flow, scenery! Pipe Dream, Moab Edge of town, very technical, benchcut into steep slope. Slickrock Trail, Moab World famous petrified sand dune riding. Everybody must ride here once in lifetime. Sovereign Trails, Moab Some excellent technical riding often on slickrock. Few sandy spots. Whole Enchilada, Moab Includes UPS, LPS, Porcupine Rim. High pucker factor, no-fall zones! Usually shuttled. Braintree/Randolph Gap loop, Rochester Two epic ATV trail climbs over ridgeline. Need very good brakes! Mount Equinox, Manchester Paved hillclimb to summit, 3200ft in 5.2 miles. Bikes only allowed for race. Gile Mtn, Norwich Switchbacky climb with ruckus 3-4mi singletrack descent. View at top. Green Mountain Trails, Pittsfield Incredible machine benchcut, flowy trails on private land. Off the charts fun factor. Mt Mansfield, Stowe Dirt road to highest peak in Vermont, site of MTB hillclimb race. Mount Snow, Westover Lift assisted trails. Service road can be ridden up. Gnarly XC races here. Stratton Ski Area, Stratton Steep, rocky service road climb to summit, 1800ft in 2.45 miles! Carvin’s Cove, Roanoke Great mountain singletrack just out of town. Clown Head was a blast to bomb! George Washington National Forest, Stokesville Site of Shenandoah Mtn 100 race, rugged ridgeline singletrack, 10mi climbs/descents. Ape Canyon Trail, Mt Saint Helens Easily a top 5 all-time trail ride. Scenery stunningly unique. Beacon Hill, Spokane Much like east coast area called Vietnam. Rocky, hilly, big drops, roller coaster stuff. Lewis River Trail, Cougar Rolling buff singletrack along river in old growth forest. Unforgettable scenery. Snowshoe Mountain I couldn’t imagine doing a 24hr race here! Monster climbs, rocks, views, just like home. Human Powered Trails, La Crosse 10+ miles of purpose built singletrack. Fast, fun, lots-o-climbing. Features to test skill. Sundance Trail System, Sundance 50+ miles of singletrack in the Black Hill mtns of Wyoming, views! Top 12 Favorite Rides: Six Within One Hour from Home, Six from Around the Country. I rate Bear Brook number one because I ride it regularly and never get bored with it. 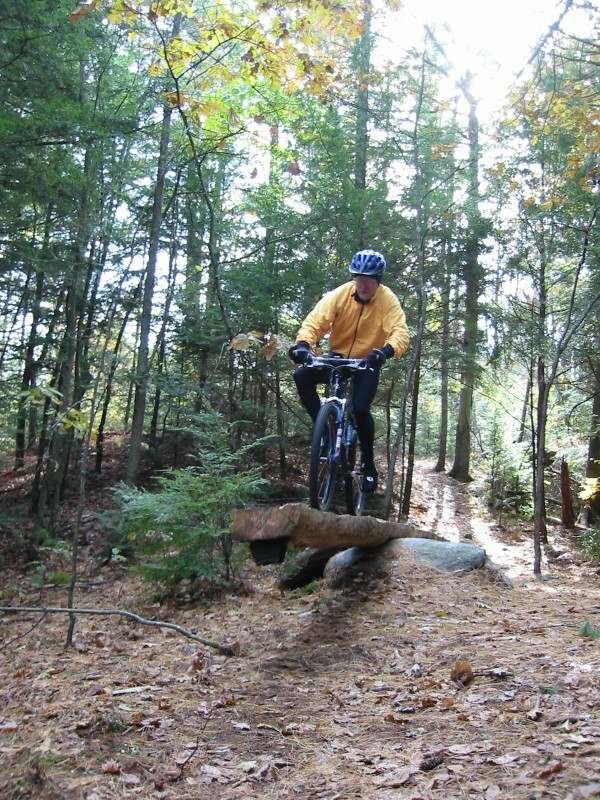 Bear Brook provides 10,000 acres with miles and miles of singletrack. As NEMBA has been building new singletrack over the last few years, the loop I like to do has evolved. Referring to the linked map, I park in the XC parking lot on Podunk Rd just off Deerfield Rd. I head north on Upper Bear Brook Trail, bear right on doubletrack One Mile trail, then bear right back on to singletrack labeled Lower Bear Brook Trail. 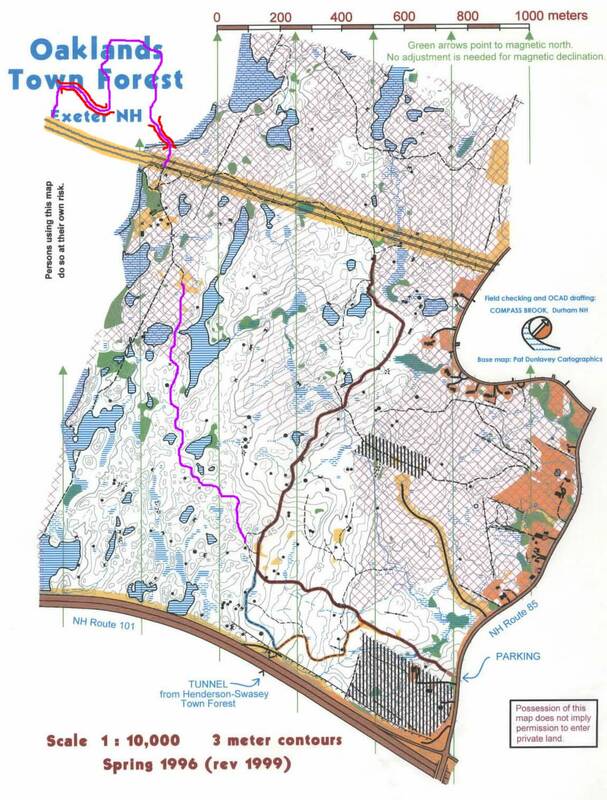 When this trail ends near the snowmobile parking lot close to the park entrance, cross over One Mile trail to a recently built singletrack, labeled Bear Brook Extension on the map. You'll pop back out on One Mile trail briefly before bearing right again on another new singletrack called Alpe d'Huez. If you come back down this trail, you'll understand the name. The many switchbacks come at you fast and furious. Alpe d'Huez merges into Sentinel Pine trail. Bear right, but not up Cascade. Sentinel is a long abandoned doubletrack that rides like singletrack now. You'll want to bear right on Carr Ridge trail. Pass through the field, pick up Podunk Road for a bit, then bear right on Bear Hill trail. Get ready to dig deep. This will head right up the fall line at 20% grade. Be sure to check out the ant mounds at the summit where a fire tower once stood. Just down from the peak, look for singletrack continuing south. This will make the climb worth it, a screaming descent down to Ferret Trail, a doubletrack. Bear right. Might be good time to drop down by Bear Hill Pond to eat an energy bar and take in the great view. Continuing on Ferret, drop below Bear Hill, bearing left at the bottom. Note signed Trail 15 that heads south. This is a nice link to the FOMBA trail system if you are ever up for a 50 mile epic day of riding. But for now, continue south on Ferret to base of Hall Mtn Trail. You'll pass a gate and it will seem like you are leaving the park, but this is best way to head up west side of Hall Mtn. The climb forces you to dig deep at the top. Not all can clean it. The summit has a double hump. You will drop 100ft, then gain it right back just as steeply. Bombing down the east side, avoid the spur to the right and continue up to the gate. Bear a hard left onto obscure single track. I think this was formerly called the I-trail, but it is legit now. This may be a bit tricky to follow by the dam and along the marsh. Just stay on singletrack. This is some of the sweetest riding in the park. You'll eventually pop out on Podunk Rd. Go left, around gate, continue straight. Turn left at first gated left about 0.25mi down. This is Ferret again. Pass Bear Hill Trail that you came down a little while ago, and this time bear right on Hedgehog Ledge Trail. This is one of the more technical trails in the park. Walk before you try. The granite staircases will spook many riders. Make sure after the granite section you bear right and begin climbing steeply up switchbacked singletrack. This will pop you back out on Podunk Rd. Bear left on Podunk, left at big field, then left again on Carr Ridge Trail at far end of field. Stay on Carr Ridge across the couple doubletrack crossings. Climb. Then get ready for a ruckus descent. Carr Ridge merges into Cascade. Bear right, ride the log steps to Lane Trail, which is doubletrack gravel road. Turn right and climb for a while. Continue straight on Lane until back to big field. Look for Little Bear Trail near entrance to field on left. This will be flat and fast for a bit, but after crossing Farm Trail doubletrack, get ready for some insane singlestrack speed. Scare yourself silly. The ride will be over in two minutes. At the bottom merge into Bear Brook trail and bear right to head back to parking lot right there. This loop entails less than half of the singletrack at Bear Brook. 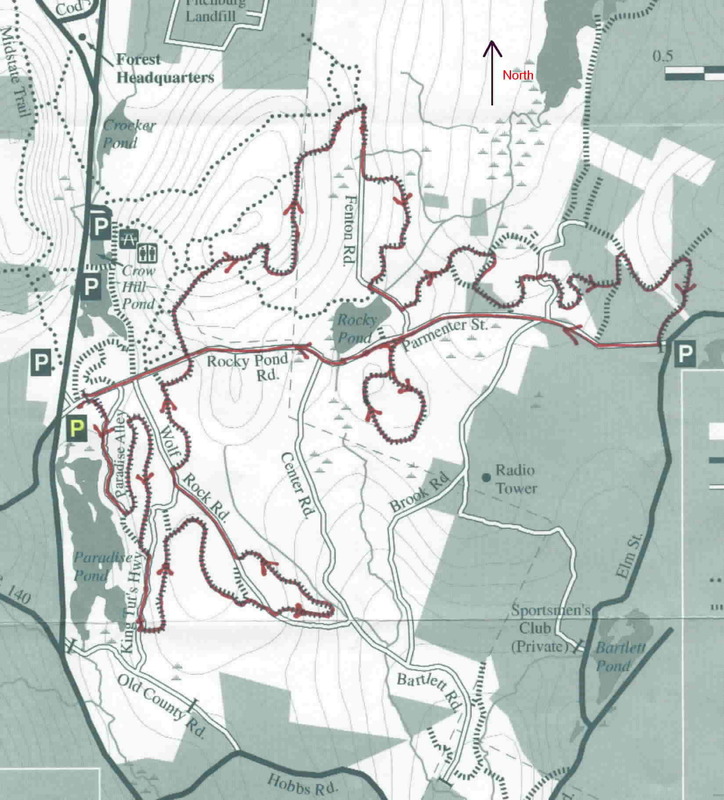 The map I created shows all of the singletrack in Bear Brook State Park. There is also a brief description of second loop that hits the eastern half of the park, including some of the newest NEMBA built singletrack. Don't forget the Catamount area too. This is where the all-mountain type riders can get their fix in. Some pretty gnarly stuff up there, but you do have to pedal yourself up there. I often add some additional climbing outside of Bear Brook to my ride. Fort Mountain (map) looms over Bear Brook to the Northeast. It has a summit of 1400 feet, giving an elevation gain of about 1100 feet from the parking area on Podunk Road. I take Deerfield Road to Mount Delight Road, but immediately after turning left onto Mt. Delight, bear left onto dead-end residential street. Take this straight off end onto jeep road. A mile or so down, take right onto jeep road just after large rocks on right. After about 0.7 miles of jeep road, continue straight on dirt road. About 0.6 miles of dirt road takes you to paved road. After only short distance on pavement, go straight off end of pavement (don’t follow pavement to left) onto another jeep road. In a quarter mile, you’ll see pavement again, but bear right to stay on gravel surface. Once you see heavy-duty power lines, follow them. They go up the service road to the communication tower on top of Fort Mountain. This begins the serious climbing. I usually can’t hold 5 mph all the way up. Very steep, switch-backed, loose gravel climb, gaining several hundred feet in a fraction of a mile. The view at the top is worth it, offering unobstructed views over 360 degrees. The ride back to Bear Brook is a real hoot. My brake rotors reach “sizzle spit” hot at bottom of service road. Altogether it’s about 10 miles out and back. Leominster is probably my second most ridden state forest or park. Leominster is 4100 acres in size and has many miles of technical singletrack. I usually park at Rocky Pond Rd on Rt 31. This gives good access to nearby 2000 foot “Wa Wa Wachusett” Mountain for a good warm-up climb. To climb Wachusett by road, take Rocky Pond Rd across Rt. 31 and Rt 140. Rocky Pond becomes Mirick Rd on the other side of Rt 140. Watch for Pine Hill Rd on the right. Take Pine Hill up to Mountain Rd, then a quick right/left into the Wachusett auto road entrance. From Rocky Pond parking lot to summit is approximately 1000 ft elevation gain in just under 5 miles. Enjoy the view! Round trip is about 9 miles (shorter, steeper one-way auto road is taken down). Take same way back to begin off-road ride. Since most of the trails in Leominster State Forest (LSF) are not named or color blazed, it is difficult to describe my loop. That’s why I include a map of “my ride” (134kB JPEG). LSF is one of the rockier places I ride, so I usually bring my full-suspension bike. No fear of death stuff here, but the numerous rock gardens will frustrate even seasoned riders. Plenty of climbing is available also. Referring to the map, I usually start in the area of King Tut’s Hwy and Wolf Rock Rd. All singletrack, all rocky. Then I cross over Rocky Pond Rd for a good climb, the biggest in LSF. This links up with the end of Fenton Rd, where another recently NEMBA-built loop of singletrack is taken. Sweet stuff. Some more singletrack is picked up off Fenton Rd. This NEMBA trail is less rocky, nicely bermed, and can be taken very fast. On the way back to the parking lot, a small loop of singletrack is taken on the left side of Parmenter St. The complete ride, including the Wachusett climb, runs about 24 miles and 2.5 to 3.5 hours. Fort Rock is becoming a popular destination for riders from Maine, New Hampshire, and Massachusetts. Its location not far from the coast makes it very accessible. 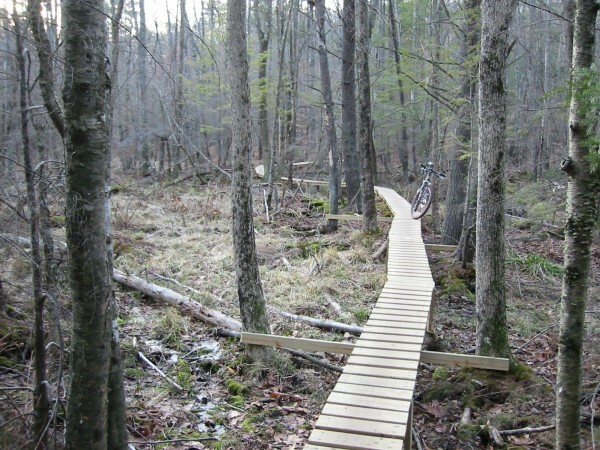 The Town of Exeter has been very receptive to proposals from the mountain biking community, and many new trails and bridges have been built recently. The divided highway, Rt 101, splits Fort Rock in half. A tunnel below the highway joins the two halves. The Oaklands half, north of Rt 101, is the largest and has the most miles of trails. There are lengthy sections of new singletrack that don't show on the town forest maps. 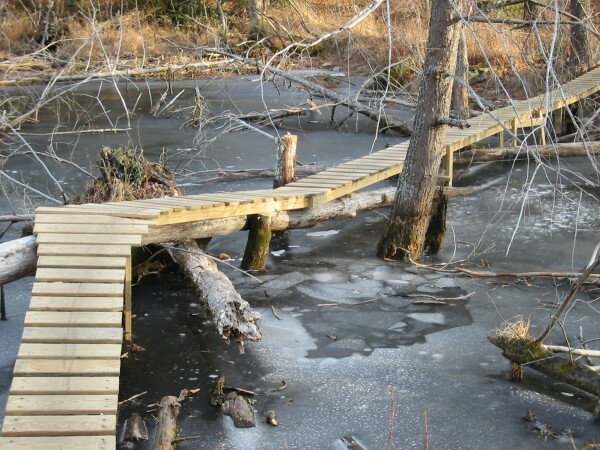 One trail contains two bridges, one that has a peaked, dog-legged section in the middle several feet above swamp water (photo). Very intimidating when I first encountered it. One winter there was a large hole in the ice where somebody went off the narrow bridge, dropped several feet to the ice and crashed through! The other bridge is about 300 feet long, a few feet above wetlands, and is flat with gentle turns in it (photo). Both bridges are well built with pressure treated lumber. There are numerous other bridges consisting of ladder, log, rock, and lumber construction types. The town land adjoins other private unposted land with many miles of single- and double-track trails with a few climbs. 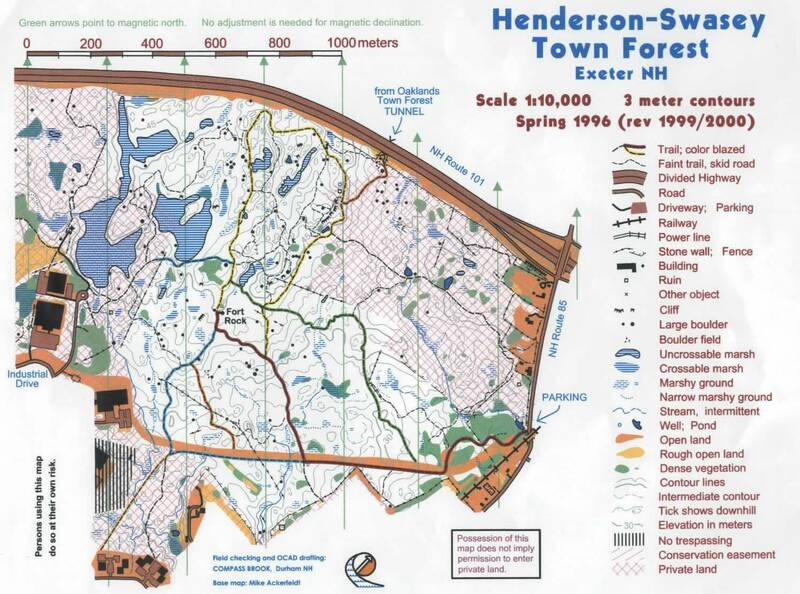 The Henderson-Swasey half, south of Rt 101, is smaller in size, but has a very high density of singletrack trails. Some are quite technical, with a large boulder playground area in the center. I once saw a large contingent of trials riders in there filming 8-foot drops off large rocks. Nearly all the trails on this side show on the town forest map and are color blazed. Several years ago, this was a pretty trashy place to ride. Park was full of dumped appliances, cars, tires, garbage, etc. Then ATV and dirt bikes shredded what was left of the place. But NEMBA volunteers started working with the forest management to clean the place up, help curb illegal activities, map existing trails, and cut new singletrack. The riding here now has become a whole different experience. Being only a few miles from my house, I ride here frequently on my singlespeed. There are no long hills, but a few short steep pitches can be found. There are open fast trails, rocky tech stuff, and a couple large boulder playground areas for freeride/trials type activities. Something for everybody, but the park is not huge. Most of the trails in this state forest can be covered at good pace in two hours. The trails are not named or blazed, but an updated map shows most of the trails and marker posts with unique intersection identifiers correlate with the map to help you orient yourself. It is best to hook up with one of the NEMBA group rides to find the best trails. On Sunday mornings, LDT can be filled with mountain bikers. LDT also seems to lose snow earlier in spring than points north, and the new (non-ATV) trails seem to drain well too. A great place to hit every few weeks. The FOMBA trail system and surrounding network of other trails has grown to the point of making it a frequent destination of mine. The FOMBA network itself consists of 10 singletrack loops linked together with fire roads. Riding all 11 and counting loops will produce at least a 12-15 mile ride. FOMBA singletrack is extremely tight, twisty, rooty, and rocky in places. No climbs, and don't expect to go too fast here. My average speeds hover around 9 mph. The trails are aggressively maintained, some say too aggressively. Areas that become quite challenging seem to get manicured before less skilled riders have a chance to cut work-around trails. The rebuilt and extended Fireline trail has many natural rock features built into it now. A few of them I do not dare attempt. When I visit FOMBA, I add in many miles of additional non-FOMBA riding. First, I head north to Tower Hill, the site of the Watershed Wahoo Race each spring. The loop around Tower Hill Pond from FOMBA is over 10 miles of riding with one 400 and one 200 foot climb. I'll ride this to get my anaerobic fix in, since much of the FOMBA riding is too tight to redline your heartrate. Another direction I'll head off to is the rocky overlook on the east side of Massabesic lake. This consists of about a five mile out-and-back with a 100 foot climb to the top. The last couple hundred yards is ledgy, bare granite and is very fun to ride. Great view looking over the lake. Finally, the other trail I hit is a gem of a trail. Not sure who built it or what land it is on, but this singletrack loop is 4 miles long, chock full of features. There's two modest ladder bridges, one very narrow log bridge over water, one large see-saw made from giant log, and several stone bridges through stream crossings. This trail is more open than FOMBA trail, so one can go faster and harder if one wishes. The trail head is about 1.5 miles east down the rail trail from the Depot Rd parking area. Hard to follow at first, but then it's all narrow singletrack. The loop dumps you out a quarter mile further down the rail trail. [Note: As of late 2005, beaver dams and logging have destroyed much of this trail. Not sure if it will come back to life.] Riding all of the FOMBA trails, the Wahoo circuit, Massabesic overlook, and the 4-miler will produce a 30+ mile ride, close to what I would call an epic. My map highlights each of these areas. Latest FOMBA map should be located here (pdf). Beaver Brook is very close to my house and only minutes from Nashua, NH. Over 20 miles of pristine, technical single and double track. There are a few short but steep climbs and plenty of rocks, roots, and narrow hewn log bridges, lest you forget you’re in New Hampshire. There are also sections that can be ridden fast for those who have a need for speed. Beaver Brook stays reasonably dry in most areas during wet parts of the year. Beaver Brook is a nature preserve and much of the singletrack is off-limits to mountain biking, so ride responsibly. I’ve not had any run-ins with hikers yet, unlike what riders experience in the Middlesex Fells. You can spin over to Birch Hill (map) one mile by road for a nearly 500 ft vertical climb up the service road to the communication tower. The ATV trail decent down to Rocky Pond is a real hoot. Couple of good rock launches. There are multiple ATV trails that lead to the summit of Birch Hill. Experiment to find what you like. The Beaver Brook/Birch Hill makes for a very interesting night ride. Riding the Monarch Crest Trail in September 2006 tops my list of all-time favorite trail riding experiences. The 403/401 loop not far away in Crested Butte comes in a very close second. The Crest loop has that “just right” magical mix of climbing, ridgeline singletrack with killer views, and miles of the flowiest descent imaginable. My friend Dave and I began this 54 mile loop by riding 18 miles up to Monarch pass on paved Rt 50. Easy grade, good views, a little traffic, but makes that ridgeline ride all the more meaningful. Most “normal” riders will hire a shuttle service from Salida to the pass and begin their ride there. Contrary to what the website says, a shuttle is NOT required, as we’ve demonstrated. Almost immediately after leaving the highway, we found ourselves on pristine singletrack climbing some more until we leveled off around 12,000 feet on the Continental Divide. Views were incredible to either side. We zigzagged along the divide several times over 10 miles to Marshall Pass. Marshall Pass sits a little lower than Monarch Pass, so there’s some descending along the way. We continued south along the crest beyond Marshall Pass, tackling a fairly respectable climb. More views popped up along the 5 miles to the Silver Creek Trail, which began our descent back to town. Silver Creek was a blast. It starts out with some full speed switchbacks which eventually stay deep in the valley along the creek. Every now and then a meadow would open up just to let you know how tall the mountains around you were getting as you sunk further into the valley. High speed was carried continuously. We followed Silver Creek until reaching the junction with the Rainbow Trail. Rainbow continues the descent for another 10 miles on singletrack, but is no longer a monotonic descent. It undulates something fiercely, forcing a couple dismounts on very short but very steep pitches to scale. 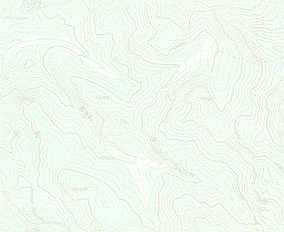 Most of the trail was buttery smooth and followed the contour of the deeply corrugated landscape. You couldn’t take your eyes off the trail for one second. The trail was maybe only 10 inches wide in places with very steep drops to the left. While carving into banked drainages, you would experience 2x or more G-forces. Likewise, when popping out of drainages or divots, you would experience moments of weightlessness. More fun than adults should be allowed to have! Eventually the trail dumps out on Rt 285, and the ride and fun are almost over. Another 6 miles bombing down smooth pavement brought us back to the car in Poncha Springs. Crested Butte was my all time top mountain biking experience when I visited in September, 2005. I was so impressed with the riding here that I returned with a friend in 2006 There are hundreds of miles of singletrack riding accessible from Crested Butte, but many locals agree trails #403 and #401 form the best loop. This ride begins right from town, gradually climbing on Washington Gulch Rd. This jeep road follows a highly scenic valley and progressively gets steeper as the junction with Trail #403 is approached. Trail #403 climbs more aggressively at first, leveling off as the pass between Mt Baldy and Gothic Mtn is reached. The expansive views of valleys to either side will blow you away. This is at an elevation of around 11,500 feet. Descending Trail #403 to Schofield Pass Rd is extreme. This was the steepest cascade of switchbacks I ever attempted. A few were just too scary to even try. Lots of loose rock about too. You are practically looking straight down on Schofield Pass Rd the whole time you’re carving switchbacks. Once reaching Schofield Pass Rd, the ride heads north and begins climbing again. Schofield Pass Rd is climbed for several miles to Schofield Pass where the northern most junction with Trail #401 is located. Trail #401 climbs first in trees, but then pops out into the open. The trail is cut high above Schofield Pass Rd on the mountain range side skirts. The view down the valley towards Mt Crested Butte is breathtaking and is frequently photographed for magazines and calendars. This narrow ribbon of singletrack has a nice downhill bias too it and goes on and on. You don’t even seem to get any closer to the valley floor after descending for considerable distance, and the view stays wide open the whole way. A series of fast switchbacks drop back down to Gothic Rd in the valley below (Schofield Pass Rd turns into Gothic Rd). But a left at this junction with a bit of climbing brings you back into singletrack bliss. This section is a little more wooded and can have some color in the fall. Cows are also more prevalent here. This finally pops out on a Jeep road that goes back down to reality at the base of Gothic Mtn on Gothic Rd. This dirt road is then bombed back to Crested Butte with more downhill along the way to enjoy. This ride covers about 36 miles and entails over 5000ft of climbing. The views will stay with you for a lifetime. A cycling-centric family trip to Alaska in the summer of 2006 entailed riding that rivaled Crested Butte riding. Even though Alaska is thousands of miles from Colorado, some of the scenery is similar. While rides in Crested Butte range from 9,000 to 12,000 feet, rides in Alaska range from sea level to 4,000 feet. The difference is Alaska is much further north. Generally, rising above a couple thousand feet places you in alpine tundra – no trees, scrubby vegetation, and expansive views. It is these qualities that make riding in these two disparate locations so similar. The capstone ride of this trip was the Resurrection Pass/Devils Pass loop near Seward. This ride runs about 50 miles with over 5000 feet of climbing, but does include some highway to get back to the car. Parking in Cooper Landing, the ride is begun at the southern terminus of the Resurrection Pass Trail. This singletrack climbs modestly much of the time for almost 20 miles to Resurrection Pass. Streams are crossed, waterfalls are passed, and lake shorelines are followed, all the while stunning snow capped mountain peaks rise up around you. There are some steep climbing sections, particularly the section after passing Swan Lake. But it isn’t long after this the views really start to open up in tundra environment. Everything was so green. This area reminded much of Trail #401 in Crested Butte. Upon reaching the high point at Resurrection Pass (elevation 2600 feet), the loop ride with Devils Pass Trail requires backtracking about two miles to begin the descent down this trail. You could continue straight on Resurrection Pass Trail for another 20 miles north to Hope, but then you would either need to have a car spotted there or ride roads for 44+ miles back to the Cooper Landing trailhead. I opted to come down Devils Pass, which descended to the east in a deep “V” valley. The trail was bench cut into steep terrain and offered open views much of the way down. The high speeds, carving in and out of streamlets, tall vegetation all had me concerned I’d run into a bear... literally. Didn’t see any bear on this ride, but did see lots of recent (fresh) evidence they were around. The Ape Canyon Trail on the flanks of Mt Saint Helens made such an impression on me I had to ride it twice in the same trip. If I ever visit the Portland, Oregon area again, this ride will be on my must do list. I rode it as an out and back, but it can be ridden as a large loop that I’ve read is hard to follow unless somebody shows you the first time. The ride begins climbing on singletrack along a huge chasm of a mud flow from the 1980 eruption. This mud flow is actually minor compared the main flow that resulted when the whole north side of Mt Saint Helens was blown away in the eruption. There are many views along the way, including many huge old growth specimens that survived the 1980 blast. After gaining about 1200 feet, the Loowit trail is reached. This is taken north through the Plains of Abraham where the grade flattens for a while. The landscape here is surreal. It is devoid of vegetation as far as you can see. The surface is mostly white pumice, but punctuated with huge black volcanic boulders. Riding here can be tricky too. Most parts of the singletrack ribbon are firm and fast, but once and a while the pumice is like riding in six inch deep marbles. One needs to be especially careful when dropping into the many washes along the way. Finally, the Truman Trail is taken across Windy Ridge. This too was fantastically fun to rip on. There are no trees standing as far as you can see here, as everything was wiped clean in 1980. Simply amazing how all the dead trees lie on the ground in the same direction. The ridge line comes to a fine cusp that was scary steep to either side. No fear of death, but scary enough you didn’t want to gaze at the postcard views while rolling. I turned around at the Windy Ridge terminus for about 1500ft of singletrack descent back to the car. Views I missed while climbing were captured on the return trip. Because you can get to Windy Ridge with a car, many riders will shuttle this ride to avoid the climbing, but it really is not that steep. It’s much easier to take in the views at slower climbing speeds. If I have the opportunity to do this ride again, I will try to make a loop ride out of it with the Smith Creek Trail. This ride is the venue for the famous annual Cream Puff 100 mountain bike race. It is anything but a “Cream Puff.” The race does three 33 mile laps, each with about 6000 feet of climbing. That’s 100 miles and 18,000 feet of climbing, and it’s touted as the toughest 100 mile MTB race in the world. I rode the Cream Puff 100 course in September 2004. The climb, 17 miles long and gaining 3600 feet, begins on 3 miles of pavement, then 14 miles of forest service roads in good shape. Not steep at all, with one significant downhill on the way up. In fact, single-speeders place in the top five on this course. The roads were poorly marked up top, and with heavy overcast the day I rode, I had no sense of bearings. I did eventually find the Alpine Trail trailhead without taking any wrong turns. The trail is a narrow, smooth, brown ribbon of singletrack. It first climbs a couple hundred feet over a small peak through magnificent old growth forest before descending a little. Then a more aggressive several hundred foot climb ensues to the summit of Sourgrass Mountain. The mountain is covered in a unique grass, presumably sourgrass, but no view the day I rode due to cloud cover. The trail then rolls up and down around 4000 feet elevation for several miles. Wicked fun stuff. Finally the descent begins in earnest, at times very steep with switchbacks. Views opened up along the way. When I thought I was getting close to the bottom, another view would open up, still way above Westfir. Some more rolling benchcut singletrack is followed before steep descending resumes. Portions of the final descent were extremely fast and smooth. Couldn’t help but wear ear to ear grin coming down this stuff. Finally the covered bridge in Westfir pops into view and I knew the ride was about over. A great loop, one I will do again if visiting Oregon. What I liked most about this ride was the remoteness of it, the lush, green old growth forest, and about 16 miles of continuous singletrack descent. There are many other trails in this area I’ve yet to explore. This is perhaps my favorite ride in SoCal. In three visits I have ridden it twice. Even though there are so many places yet to explore, this ride was so good the first time I did it that I had to do it again. I start right from the national forest ranger station in town. Gridley Trail starts as a double-track on the edge of town, winding through orange groves. The first little bit is very steep, then the grade moderates. As the climb continues, the trail gets narrower and narrower, until it becomes a ribbon of singletrack. The entire trail is benchcut into extremely steep pitches, but rises at a surprisingly moderate rate. There are many areas that are very scary to look down, almost looking straight down your outside leg at the singletrack you were on minutes ago hundreds of feet below. Shaly rock slides also fill the trail in places, leaving nasty off-camber, loose surfaces to ride on. If you washed out on some of those, nobody would ever find you again! From town, Gridley gains about 3750 feet in 10 miles of continuous climbing to the summit of Nordhoff Peak. The views are incredible as you switchback many, many times working up steep canyons to the top. From the top, Pratt Trail is taken back to town. This descent is very similar to the climb: moderately steep grades, near shear drop-offs to side of trail, and hair-pin switch-backs. Really need disk brakes for this kind of riding. Not sure if a set of rim pads would hold up whole way down. The full loop ran about 17 miles.